For cleaning, light sanding and removing tarnish from brass. Use on metal, glass, wood, aluminum and plastics. For use with the EZ402 EZ lock mandrel (SKU #482.4447) or standard 402 mandrel (SKU #619.9400). Includes 2 fine 320 grit buffs. Dremel Engraving Cutter, 3/32 in Diameter, 9-9/16 in Length, Ball Shape, 1/8 in Arbor/Shank, Carbon Steel, Silver, Applicable Materials: Wood, Fiberglass, Plastic and Soft Metals, 3/32 in Shank Diameter, Single Cut Tooth, For Engraving, Carving and Routing For No. 275, No. 285, and No. 395 Type 3, 4 and 5 Moto-Tools. Easily cuts off slots bolts, screws, sheet metal, thin wood and plastic, trim castings and molded ceramics. Cuts only along its edge. Do not attempt to sand or cut curved holes. Do not run in excess of 30,000 RPM. Use with No. 402 mandrel. Used for sharpening chain saw blades, quickly and easily. Used for sharpening chain saw blades, quickly and easily. Sanding Band covered with 60 grit aluminum oxide abrasive. Use for rough shaping, smoothing wood or fiberglass, removing rust from metal surfaces and shaping rubber surfaces. Bands are easily replaceable on drums. Do not use in excess of 30,000 RPM. A high quality industrial abrasive made for extended general purpose grinding on metals, castings, welded joints, rivets and rust or for working with conical surfaces. Do not run in excess of 30,000 RPM. Used for sharpening chain saw blades, quickly and easily. 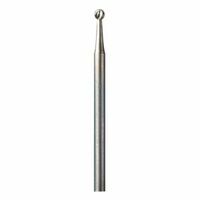 Compatible with both No.EZ402 EZ lock mandrel and standard No.402 mandrel and all Dremel rotary tools. Refinish furniture, clean grills, remove paint, tarnish and more. Includes 2 buffs, 1 coarse, 180 grit and 1 medium, 280 grit. For slicing and cutting metal, wood and plastic. Easily cuts or slots bolts, screws, sheet metal, thin wood and plastic. Trims castings and molded ceramics. Cuts only along its edge. Do not attempt to sand or cut curved holes. Do not run in excess of 30,000 RPM. Use with No.402 mandrel. Made of high quality steel. Use for shaping, hallowing, grooving, slotting, making tapered holes in soft metals, plastics and woods. Do not run in excess of 30,000 RPM.